Science is most marvelous when it's creating an explosion, even at the tiniest of proportions. In the video below, Daniel Rosenberg from Harvard's Natural Science Lecture Demonstration Services reveals the secret to shooting a cork rocket over twenty meters using a little chemistry and an ultraviolet LED light. 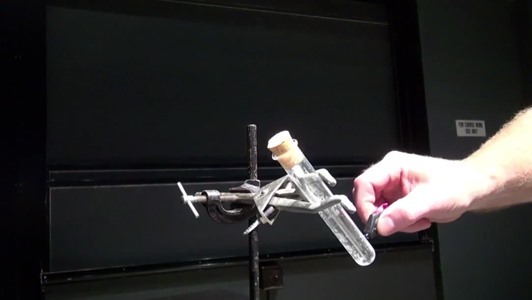 Rosenberg, who's a research assistant and lecturer for the Natural Science division at Harvard, demonstrates what happens when hydrogen and chlorine are explosively "burned" together to form hydrogen chloride, initializing the reaction with an ultraviolet light from a miniature LED flashlight. The hydrogen and chlorine are housed inside a corked quartz test tube held by a three-jaw clamp on a small stand. 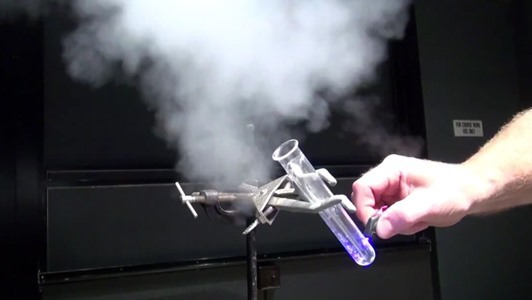 The ultraviolet light is exposed to the bottom of the corked test tube, initiating the reaction by splitting up chlorine molecules into chlorine atoms so that a free radical chain reaction can take place, which is why the explosion is, as Rosenberg puts it, "such a dang fast reaction." The cork subsequently flies twenty meters across the lecture hall. The shooting cork is also filmed in slow motion at 480 frames per second at the end of the video, though the image is quite blurry. But it's still a great chemistry experiment to try out at school or in the lab (with the proper precautions, since this is dangerous experiment). Check out more of Harvard's Natural Science Lecture Demonstrations on YouTube or Facebook. Harvard Science Center Hall B???? ?